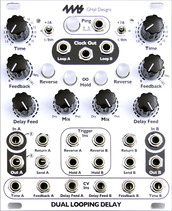 We've recently become an authorized 4ms dealer and 4ms has quickly become one of our favorite modular synth brands. They've been designing and building innovative audio electronics for musicians since 1996. 4ms offers alternatives to ordinary instruments by utilizing poly-rhythmic clock modules which create evolving complex mathematical beat patterns, resonators that transform pop music into micro-tonal keys, a random chaos generator to name a few. Rather than re-invent old concepts 4ms turns innovative ideas into playable musical tools that expand the possibilities for musicians to create. The DLD is an advanced digital audio processor eliminating the need for tape or analog emulation which results in a modern crystal-clear digital delay. The DLD combines delay, looping, and sample-tight synchronization resulting in an impressive dynamic sound capture and modification. The DLD can be integrated with modular timebase and sequencng modules such as the 4mx Quad Clock Distributor. The 4ms QCD Quad Clock Distributor offers four CV controlled clock divider.multipliers, a tap tempo button and five synced clock outputs which make the QCD ideal as a head-of-the-chain master clock module. The tap clock runs at the tapped tempo ever if other channels are being clocked externally. Each channel has an independent clock in/out reset and div/multi CV. This module is loaded with features. See additional QCD details or buy a 4ms QCD Synth module online.